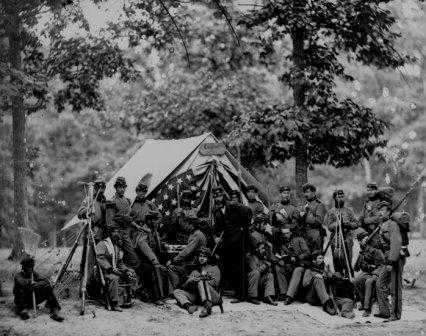 The Union Army of 2,100,000 soldiers was nearly twice the size of the Confederate Army of 1,064,000. It was the deadliest war in American history. There were around 210,000 soldiers killed in action and 625,000 total dead. Thirty percent of all Southern white males between the ages of 18 and 40 died in the war. Around 9 million people lived in the Southern states at the time of the Civil War. Around 3.4m were slaves. Sixty six percent of the deaths in the war were due to disease. In the Second Battle of Bull run many of the wounded were left on the battle field for 3 to 4 days. John and George Crittenden were brothers who were both generals during the war. John for the North and George for the South! Lincoln's famous Gettysburg address was only 269 words long. Stonewall Jackson, one of the South's greatest generals, was killed by friendly fire. Lincoln dreamed of getting assassinated only a few days before he was killed by John Wilkes Booth. Only 1 in 4 Southern farmers owned slaves, but it was the rich and powerful farmers who owned them. In the first few battles each side did not have regular uniforms. This made it tough to figure out who was who. Later the Union would wear dark blue uniforms and the Confederates gray coats and pants. Many of the Southern men already knew how to shoot a gun from hunting. The Northern men tended to work in factories and many didn't know how to fire a gun. Bayonets were sharp blades attached to the end of rifles. President Lincoln asked Robert E. Lee to command the Union forces, but Lee was loyal to Virginia and fought for the South. After the war, General Lee was so appreciative of General Grant's terms and behavior when he surrendered that he would not allow a bad word said about Grant in his presence. During Sherman's March to the Sea, the Union soldiers would heat up rail road ties and then bend them around tree trunks. They were nicknamed "Sherman's neckties". After John Wilkes Booth shot Lincoln, he jumped from the box and broke his leg. However, he still managed to stand up on the stage and yell out the Virginia State Motto "Sic semper tyrannis" which means "Thus always to tyrants". Clara Barton was a famous nurse to the Union Troops. She was called the "Angel of the Battlefields" and founded the American Red Cross.